As it stands, that statement is not at all consistent with the message of hope that Christians have in Jesus. The Bible speaks of having hope, not giving up hope. But there is at least a grain of truth in the saying, a grain of truth that is applicable to our faith and is consistent with the Bible. Hope, in and of itself, is neither good or bad, true or false, wise or foolish. It all depends on what you are hoping for. The Bible offers the one and only lasting source of hope—faith in Jesus Christ. All other hopes are either temporary or false. It is usually a good thing to have some kind of hope to keep you going. But quitting your job because you bought a lottery ticket and you are hoping to win big and there is no need to work when you are going to get 268 million dollars– would not be a good idea. The Bible condemns all our false hopes because they keep us from our best and true and ultimate hope. The Old Testament prophets condemned the way their kings ignored God and put all their hope in their armies. Jesus was critical of the hopes people placed in their money or power or prestige. In fact, the whole Biblical salvation history makes it clear that God is more than ready to destroy our false hopes, and bring us to ruin and destruction if that is what it takes to bring us to the true hope of salvation. And just because one is a Christian does not mean their deepest hope is in Jesus. Many Christians believe in Jesus and possess the greatest hope and security possible, but then in their daily lives keep on clinging to all sorts of false hopes; and then they get all the disappointments that come with that. We all do this. We all have our temporary and unreliable hopes. Parents hope for kids that won’t disappoint and hurt them, kids hope for parents that will not misunderstand them, and husbands and wives hope their partner that will always see things their way. Farmers and gardeners hope for just enough rain each year, but not too much. We hope for a predictable economy so we can know where we are at from now on, and we hope for no setbacks, financial or otherwise. We hope for neighbors that will not irritate us, a job that will always please us, and that time would slow down a bit and not keep flying by us so fast. Can you see why we are always getting disappointed? We all have lots of things we hope for, and many of them are false hopes. It’s not wrong to hope for any of those things; but we do need to realize that the hope offered in God’s Word is a different kind of hope. And nowhere does the Bible guarantee a life without disappointment. The saying “I feel much better now that I have given up hope” has nothing to say about our hope in Christ. We do not want to give up on that hope. But it has much to say about our false hopes. We spend so much of our time hoping for the time when better things will come our way, that we often forget about all the blessings we already have. In giving up on our desperate hopes for something more or different, we can actually begin to feel better by appreciating what God has already given us. Oftentimes, our hopes become unrealistic expectations, and can lead us into despair instead of hope. For example, a wife lives in daily disappointment and frustration because her husband is not as interesting as he used to be or as understanding as she had hoped; she forgets to be thankful that he has always been a good provider, is a good father to their children, and is faithful to her. A young man envies his friends who all have jobs where they seem to work a lot less and earn a lot more; he fails to be thankful for the job he does have, and the fact that he does really like many things about it. A teen-age girl was hoping she could start on the basketball team, and lives in misery because she spends most of the time sitting on the bench; she forgets that she does have an easier time getting good grades on her schoolwork than all of her friends. You can probably make your own list for your own life. None of this means anyone should give up on working for a better life. But as we work toward our goals we must not lose sight of the blessings already given. And no matter how hard we work or how bad we want something, the disappointments and crushed hopes do still come our way. And as we make the necessary adjustments to reality, we might even find ourselves agreeing with the ‘brilliant’ words of Mr. 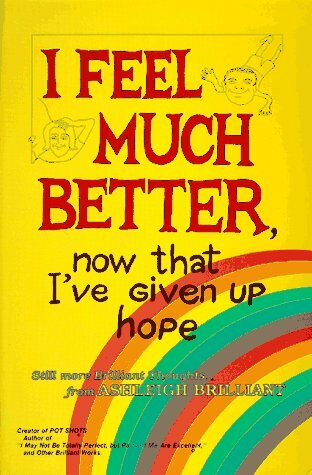 Brilliant: “I feel much better now that I have given up hope.” The less we hope for and expect, the less we will be disappointed. Again, this is not the whole truth, but does contain a grain of truth. We dare not put all our trust in our earthly hopes, because even if all those best hopes are fulfilled, it is always, only, for just a little while. Ecclesiastes 2:1-11 (portions) — I said to myself, “Come now, I will test you with pleasure to find out what is good.” But that also proved to be meaningless… I tried cheering myself with wine, and embracing folly… I wanted to see what was good for people to do under the heavens during the few days of their lives. I undertook great projects. I built houses for myself and planted vineyards. I made gardens and parks and planted all kinds of fruit trees in them. I made reservoirs to water groves of flourishing trees... I also owned more herds and flocks than anyone in Jerusalem before me. I amassed silver and gold for myself, and the treasure of kings and provinces. I acquired male and female singers, and a harem as well; all the delights of a man’s heart. I became greater by far than anyone in Jerusalem before me… I denied myself nothing my eyes desired; I refused my heart no pleasure. My heart took delight in all my labor, and this was the reward for all my toil. Yet when I surveyed all that my hands had done and what I had toiled to achieve, everything was meaningless, a chasing after the wind; nothing was gained under the sun. Our hearts are restless, O Lord, until they can find their rest in you. –St. Augustine of Hippo (354-430), in Confessions. This entry was tagged hope. Bookmark the permalink.